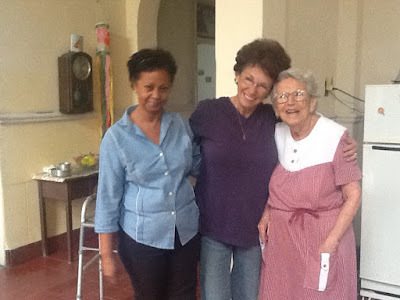 Stories and Archives : My Last Trip to Cuba: When Are You Going to Finish this Book??? My Last Trip to Cuba: When Are You Going to Finish this Book??? I write these chapters for you months after returning from Cuba, and the trip to Cuba really doesn't end until I finish this story for you, so maybe that's why I'm taking my time. I know how it ends and I'm not in a rush to get either of us across that finish line, so let me tell you a story about yesterday. My new car has the bluetooth thing that lets me call my Mom when I'm alone driving in endless circles of drop off pick up park and wait and start again. This is how we spend Quality Time. Mom answers and we make small talk about cooking for Veterans and whether Zack was at school (he was), then Mom tells me she's with Abuelo. I guess he's on speakerphone on her blackberry or they're hearing me in HER car, so I shout HEYYYYYYYYY ABUELO. Listen, he says in English which is funny because he usually likes to take my Spanish for a walk around the block, When are you going to finish this book? I am waiting! I'm delighted to play even a tiny part in entertaining him because from what I can see from here, being in your 90s is stressful, painful, boring and frustrating. "I can have it done in two weeks!.... errr.....three weeks! ...um....By the end of the month I swear!" He chuckles and says "Alright." My Mom remembers she hasn't printed the last chapters for him and promises to do so. After a beat of silence my Mom tells me that she talked to the people in Cuba and they say TiaLourdes isn't doing well. I exhale loudly, still not sure whether I'm on speakerphone or not. I'm so sorry to hear that! That's sad! Mom agrees that it is sad and we talk for a few more seconds before the heaviness pushes our hearts so low we find reasons to get off the phone. Later that night I'm driving across town again and I call Mom back. This time she's alone and she tells me that Abuelo had been asking questions like whether TiaLourdes would be buried in Cuba or brought here. Mom told him she didn't know, but that she would ask. It's important to plan, and this is the time to plan, he told her, sounding much like a responsible older brother and patriarch. She agreed, it is a good time to plan. I sat in silence and cried a little, not the kind of crying that would make me have to stop driving, more like itchy allergy eyes. It's hard to let TiaLourdes slip into the sky, not so soon, not when Cuba is finally almost thinking about being THIS close to actually having serious talks about maybe soon for the right price CHANGING. TiaLourdes can't go yet. It isn't fair. By my calculations, because of time lost to Castro and communism and the embargo and all of that, I need at least 10 more years with her to learn half of what she needs to teach me. After those ten years, ask me again if I'm ready to let TiaLourdes go, but don't ask me yet, I have to finish this book for Abuelo.